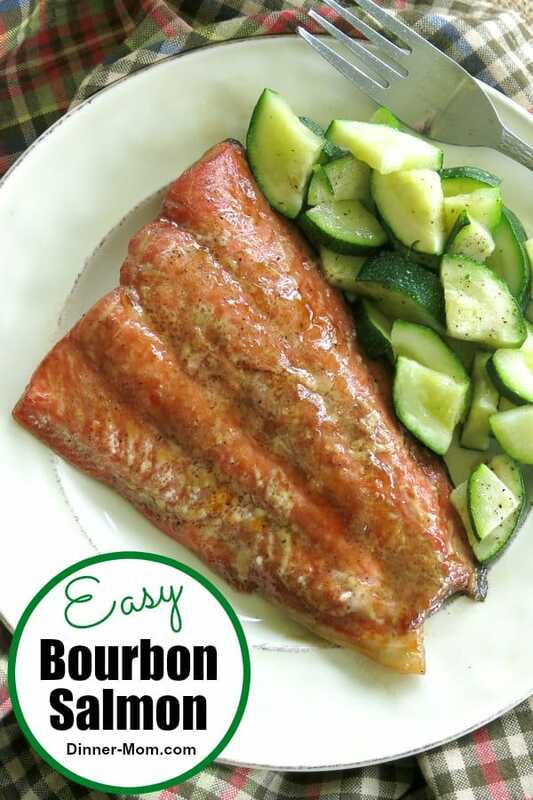 This Bourbon Marinated Salmon is so good, you will never need to order it out again! It was a favorite at our make ahead meal assembly store. Forget heading out to Cheddars, Ruby Tuesday or even Publix. It rivals any salmon entree you can order at a fine restaurant so I feel a little indulgent without really splurging. It’s a “good for you” fish, since it boasts high levels of omega-3 fatty acids (which lowers the risk of heart disease, among other benefits.) Ya-da, ya-da, ya! It cooks quickly, is complemented by almost any vegetable I have on hand. I plan for leftovers and flake the fish cold over salad greens and have a spectacular lunch the next day. The marinade has a bold and slightly sweet taste. Coconut sugar (or brown sugar) makes is sweet. But, it definitely owes its distinctive flavor to the bourbon. Please don’t let the alcohol scare you away from this recipe though. You don’t have to drink hard liquor or buy a big bottle of bourbon whiskey to make this one. 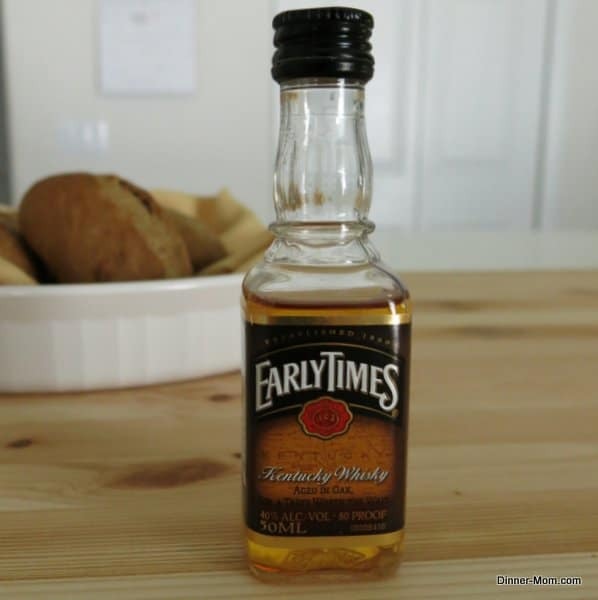 Just buy one teeny, tiny inexpensive bottle of bourbon, like the one shown here. It makes lots and lots and lots of marinade. You’ll end up discarding the excess marinade and/or cooking off the alcohol. The preparation for bourbon marinated salmon is easy. Simply combine all the ingredients together and marinate for a few hours. If you want to make up the recipe to freeze, just place the tightly sealed bag in the freezer, removing as much air as possible. Not long at all and that’s another thing I love about seafood in general and this recipe! In a 375 degree F oven, it only takes about 10-15 minutes, depending upon the thickness of the fish. A good rule of thumb is about 10 minutes per an inch of thickness. The fish is done when it separates easily with a fork. I always use my trusty thermometer and cook it to a temperature of 145 degrees F.
It’s fantastic on the grill too! This salmon goes will with almost anything. You won’t be disappointed. Customize the preparation of this bourbon marinated salmon recipe to meet your needs. For example, portion 2-3 salmon fillets in a bag and use half of the ingredient amounts listed. To make up several batches at a time, line up plastic bags that zip in canisters or bowls for easy assembly. For the best quality, cook salmon within 2-3 months of freezing. 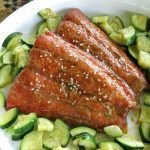 Bourbon Marinated Salmon was one of the very first recipes that I ever posted. I updated the pictures and tweaked the post a bit. But, I didn’t change the recipe format…because you are going to want to make up batches for the freezer. It just didn’t deserve to be buried at the back of The Dinner-Mom site with less than desirable photography. It’s that good. I hope you enjoy it! 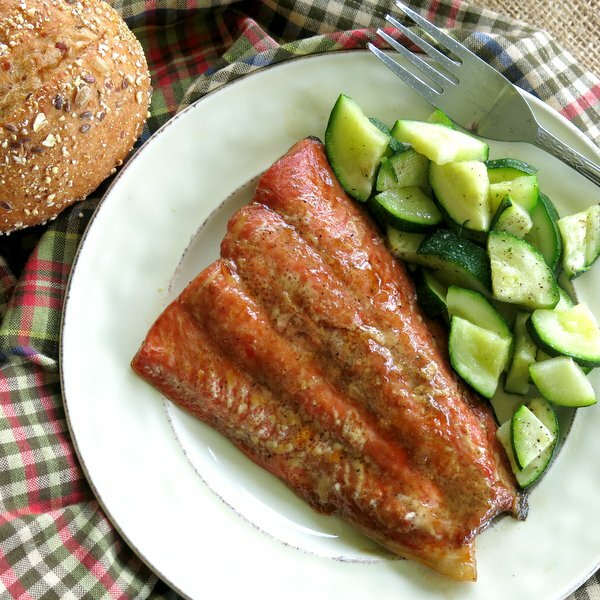 Salmon in a bourbon glaze is a delicious way to enjoy this healthy fish. Add all of the ingredients, except for the salmon, to a plastic bag that seals. Seal the bag and gently massage to combine ingredients or gently stir with a spoon. Lift the salmon fillets into the bag with the marinade. Seal tightly, removing excess air, and gently turn to coat. Allow the salmon to marinate about 2 hours. 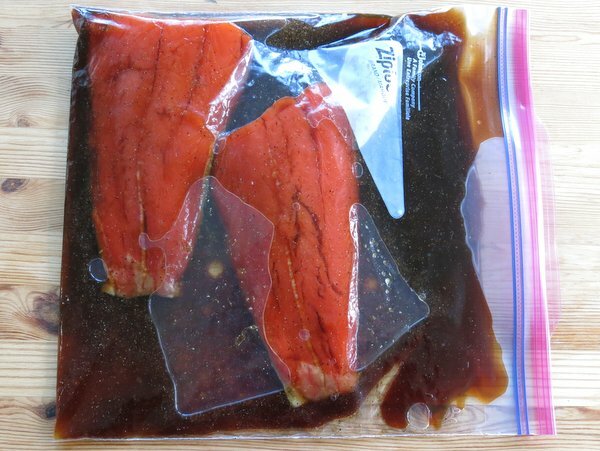 Turn fish in bag as necessary to ensure that marinade is distributed evenly over fish. Remove fish from bag and discard marinade. Preheat oven to 375 degrees F and bake skin side down for approx. 10-15 minutes (10 minutes per inch of thickness.) Fish is done when flesh is opaque and separates easily with fork. Alternatively, grill salmon over medium-high heat. If you will be freezing this entrée to enjoy later, place the bag with the salmon fillets and marinade inside another plastic bag for extra protection during storage. Label with cooking instructions by printing a copy of the recipe/cooking directions and placing it between the bag layers. Freeze bags in a flat position for efficient storage and so that the fish and marinade will defrost quickly. Thaw fish in refrigerator for 24-36 hours, if frozen. Note that nutrition estimate assumes only half of the marinade will be consumed. I find that often even less is consumed. Note: This recipe was previously published on August 22, 2013 and was updated to include new pictures. NEVER MISS A RECIPE! SUBSCRIBE BY EMAIL & RECEIVE A FREE E-Book! I love a good salmon dish. So great that you can put this together in advance to make dinner come together quickly once you’re ready to cook! Looks and sounds yummy! Are those sesame seeds on the salmon in the picture? Hi! Yes – In a few pictures sesame seeds are used as garnish. Chopped scallions are also a nice addition. I’m always on the lookout for good salmon recipes! This one was so easy to make. Glad I don’t have to buy a big bottle of bourbon to enjoy! Hi! Those are zucchini that have been quartered, tossed with a little olive oil and sprinkled with salt and pepper. Cook them along side the salmon for a complete meal!